In 1938, the Pennsylvania Railroad introduced the world's largest steam locomotive, the S-1 and distinctive round-ended observation cars for its Broadway Limited. They were designed by Raymond Loewy in collaboration with Paul Philippe Cret, head of Architecture at the University of Pennsylvania. The S-1, with its bullet-nose, projecting headlight and horizontal chrome strips extending the length of the engine, was an improved version of the K4S Loewy designed for PRR in 1936. The S-1, capable of 100 mph speed, was a feature attraction at the 1939 World's Fair. Only one S-1 was ever built, but like most of Loewy's work for PRR, served as an incredible PRR promotional piece, and not incidentally, identified Loewy forever with the streamlined train. Loewy also designed the T-1 steam locomotive in for PRR, a later version of the S-1 with a wedge-shaped nose. Fifty were built, but they were soon discarded as PRR switched to diesel locomotives. Raymond Loewy (1893-1986), probably the most widely known US industrial designer, was born in Paris. He studied engineering 1910-1914, served in the French army in World War I and arrived in US in 1919. He worked as a fashion illustrator for Vogue and Harper’s Bazaar, and designed costumes for Florenz Ziegfeld. Opening his own office in 1929, his first product assignment was a duplicating machine for Gestetner, which was featured in a 1934 Fortune magazine article. Major clients included Pennsylvania Railroad, Coca-Cola, International Harvester, Studebaker, and NASA. He was on the cover of Time magazine in 1949. He wrote "Never Leave Well Enough Alone" in 1951, and "Industrial Design" in 1979. By 1960, he had a staff of 180. His US office filed for bankruptcy in 1977, closing US offices but keeping those in Europe. 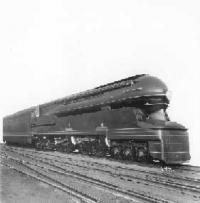 On the same day that PRR introduced the S-1, New York Central Railroad introduced 10 new streamliner J-3 steam engines and cars designed by Henry Dreyfuss for its Twentieth Century Limited New-York-Chicago run. An upgraded version of Dreyfuss’s 1936 Mercury design, the new J-3 4-6-4 Hudson locomotives featured finned bullet-noses reminiscent of ancient warrior helmets. Henry Dreyfuss (1904-1972) was born in Brooklyn, NY to a family in the theatrical materials supply business. He completed studies as apprentice to Norman Bel Geddes in 1924. He produced 250 stage sets for a number of theatres 1924-1928 and opened his own office in 1929 for stage and industrial design activities. Dreyfuss focused on design problems related to the human figure, working on problems from "the inside out", and believed that machines adapted to people would be the most efficient. Major clients included Bell Telephone, AT&T, John Deere, and Polaroid. He published "Designing for People" in 1955 and "The Measure of Man" in 1960. He became the first president of IDSA in 1965. Retired in 1969 and died tragically.